"The future of Libya belongs to its people"
Prime Minister David Cameron has made a statement to Parliament on the latest situation in Libya after co-chairing the Paris Conference on Libya last week. “With permission, Mr Speaker, I would like to make a Statement on Libya. When we met here on that Friday in March, Qadhafi’s tanks bore down on Benghazi. His air force had already begun strikes against his people there. And his army had smashed through Zawiyah with grave loss of life. Qadhafi had vowed to hunt down his people like rats, using the full might of his armed forces, backed up by mercenaries. Britain could not stand by as Qadhafi slaughtered his people. Nor could we allow a failed pariah state festering on Europe’s southern border, with the potential to threaten our own security. The Libyan Opposition and the Arab League both called for NATO to protect the civilian population. So together with the US and France, we secured agreement for UN Security Council Resolutions 1970 and 1973. And with this clear legal mandate, this House voted by a majority of 544 in favour of military action. Today the Libyan people have taken their country back. Mr Speaker, I am grateful for the support that all sides of this House have given throughout the last six months and I am sure the whole House will join me in paying tribute to the incredible dedication and professionalism of our pilots, sailors and ground crew. But we should also pay tribute to the bravery and resilience of the Libyan people themselves. This has been their revolution and none of it would have happened without them. Ordinary Libyans from all walks of life came together and rose up against Qadhafi. From the villages of the Nafusa mountains to the tower blocks of Misurata, the alleyways of Zawiyah and the streets of Benghazi the Libyan people fought with incredible courage. Many paid with their lives. Others have been seriously injured. And the struggle is not over. And the long work of building a new Libya is just beginning. But what is clear is that the future of Libya belongs to its people. The task of the international community now is to support them as they build that future. That means helping to finish the job ensuring security, helping to address the immediate humanitarian needs and supporting the Libyan people as they lead the longer-term process of reconstruction and political transition. Let me address each in turn. Britain has been at the forefront of the military operation to protect the Libyan people. Our planes and attack helicopters have made 2,400 sorties across Libya carrying out one fifth of all NATO airstrikes, against some 900 targets in Qadhafi’s war machine. Our warships have supported this effort, helping enforce the UN arms embargo, and bringing aid to those in need. …supported over the course of the operation by 8 warships and a hunter-killer submarine. But the job is not over. As we stand, the Free Libya Forces have liberated Tripoli and control Libya’s key population centres. But, pro-Qadhafi forces still pose a threat and in particular control the towns of Bani Walid, Sirte, and Sebha in the south. The National Transitional Council has been working to negotiate a peaceful outcome. But their leaders have explicitly requested that NATO continues its operations to protect civilians until that is achieved. Over the weekend RAF Tornados struck eight military command and control installations South-West of Waddan and nine weapons and ammunition stores near Sirte. For as long as Qadhafi remains at large, the safety and security of the Libyan people remains under threat. We will not let up until the job is done. First, Britain and its NATO allies will continue to implement UN Security Council Resolutions 1970 and 1973 for as long as we are needed to protect civilian life. Those thinking NATO will somehow pull out or pull back must think again. We are ready to extend the NATO mandate for as long as is necessary. Second, we will support the Libyan people in bringing Qadhafi to justice. Mr Speaker, this is a man whose crimes are becoming ever more apparent every day and who is wanted by the International Criminal Court. There must be no bolt-hole; no pampered hiding place from justice. He must face the consequences of his actions, under international and Libyan law. Turning to security, the early signs have been encouraging. There has been some looting but it has been focused on symbols of the former regime. The National Transitional Council is moving to stand down fighters from outside Tripoli. The police are returning to the streets. And the Council leaders have been clear and consistent in cautioning against disorder and against reprisals. …working closely with the National Transitional Council in securing chemical weapons’ sites and supporting mine clearance in Misurata, Benghazi and other affected areas. On the humanitarian situation, Britain has played a leading role from the outset. Of course substantial challenges remain. The priorities are health, water, food and fuel. On health, our humanitarian partners report that hospitals and clinics in Tripoli are now functioning well, with staff returning to work. Britain is providing additional support through the ICRC, including surgical teams and medicines to treat up to 5,000 war-wounded patients. On water, substantial numbers of people in Tripoli are still without running water. However, UNICEF is procuring 11 million litres of bottled water, and the Libyan authorities are working to repair the water systems. …and there is already evidence of improved supplies. Britain has also helped to provide additional food supplies for nearly 700,000 people. …and the World Food Programme shipment is supporting the National Transitional Council with the procurement of 250 thousand tonnes of fuel. The National Transitional Council will continue to lead the response to the humanitarian situation, working with the UN Humanitarian Coordinator and other humanitarian agencies. And Britain will continue to play its full part. Mr Speaker, Libya is a country of 6.5 million people. It’s one of the richest in Africa. Its proven oil reserves are the ninth largest in the world and in relation to their GDP, bigger than Saudi Arabia. Libya is fully capable of paying for its own reconstruction. Of course there is a role for foreign advice, help and support but we don’t want to see an army of foreign consultants driving around in four by fours giving the impression this is something being done to the Libyans, rather than done by them. What the Libyans need above all is their frozen assets back. A week ago Britain got Security Council agreement to release £1 billion worth of dinars back to the Central Bank of Libya. And RAF planes have already flown in hundreds of millions of dinars of Libyan banknotes. At the Summit in Paris last Thursday, the international community committed to unfreezing $15bn of Libyan assets. And for their part, we expect the new Libyan authorities to meet their pledge of ensuring transparent and accountable financial systems. Some people warned - as Qadhafi himself did - that the Libyan people could not be trusted with freedom; that without Qadhafi there would be chaos. What is emerging now, despite years of repression, and the trauma of recent months, is immensely impressive. Enormous difficulties lie ahead but the Libyan people are showing the world their resilience and spirit. In a far-reaching Roadmap and Constitutional Declaration the new authorities have set out a clear vision and process for a new democratic Libya. This is not being imposed from above; it is being shaped by the Libyan people. And Libya’s new leaders are clear about the sort of Libya they want. At the Paris Summit, Chairman Abdul- Jalil spoke of his determination to build a society of tolerance and forgiveness, with respect for the rule of law. A national conference will bring together all the tribes, civil society, men and women, from east and west, united to shape the political transition. And they are planning for a new constitution and elections within 20 months. 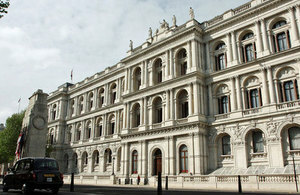 Britain is also in discussions in New York about a new UN Security Council Resolution to reflect the new situation. The new Libyan authorities must now be able to represent their country at the United Nations, as they did last week at the Arab League. Mr Speaker, I also look forward to building a bi-lateral relationship with the new Libyan authority. We have close relations with the National Transitional Council through our mission in Benghazi. And today the UK’s Special Representative is deploying to Tripoli to re-establish our full diplomatic presence. Our relationship with the new Libya must of course deal with a series of problems from the past. On Megrahi, this is obviously a matter for the Scottish Executive. But I have made my position clear. I believe he should never have been sent back to Libya in the first place. On WPC Yvonne Fletcher, I want to see justice for her family. There is an ongoing police investigation, and the House will wish to know Prime Minister Jabril has assured me of the new Libyan authority’s intention to co-operate fully. Finally, significant accusations have been reported today that under the last government relations between the British and Libyan Security Services became too close, particularly in 2003. It was because of accusations of complicity by the British Security Services in the mistreatment of detainees overseas, including rendition, that I took steps last July to sort this whole problem out. As the House will remember we took steps to bring to an end the large number of court cases being brought against the government by former inmates of Guantanamo. We have issued new guidance to security service personnel on how to deal with detainees held by other countries. And we have asked Sir Peter Gibson to examine issues around the detention and treatment of terrorist suspects overseas and the Inquiry has already said it will look at these latest accusation very carefully. My concern throughout has been to deal with these accusations of malpractice so as to enable the Security Services to get on with the vital work they do. And because they can not speak for themselves, let me put on record once against our enormous gratitude for all they do to keep our country safe. Mr Speaker, the achievement of the Libyan people gives hope to those across the wider region who want a job, a voice and a stake in how their society is run. On Syria, Britain will continue to lead the argument for a UN resolution to build on the EU’s oil embargo which is now in place. The message to President Assad must be clear: he has lost all legitimacy and can no longer claim to lead Syria. And he must step aside for the good of his country and his people. Mr Speaker, it is the Libyan people who have liberated Libya. There was no foreign occupying army. This has been a Libyan-led process, assisted by the international community. Libyans never wanted to have foreign troops on the ground. This was our view too, along with the Arab League and the rest of the international community. Many cynics proclaimed stalemate and asserted that Qadhafi would never be defeated. The Libyan people proved them wrong. It was a unique set of circumstances and not something that we can or wish to repeat all over the world. But I have never accepted the argument that because you can’t do everything, you shouldn’t do anything. Mr Speaker, removing Qadhafi from power was a major achievement. Although the work is not yet done, the Libyan people can be proud of what they have achieved and we can be proud of what we have done to help them.